Italian Restaurant La Oca Da Sergio. 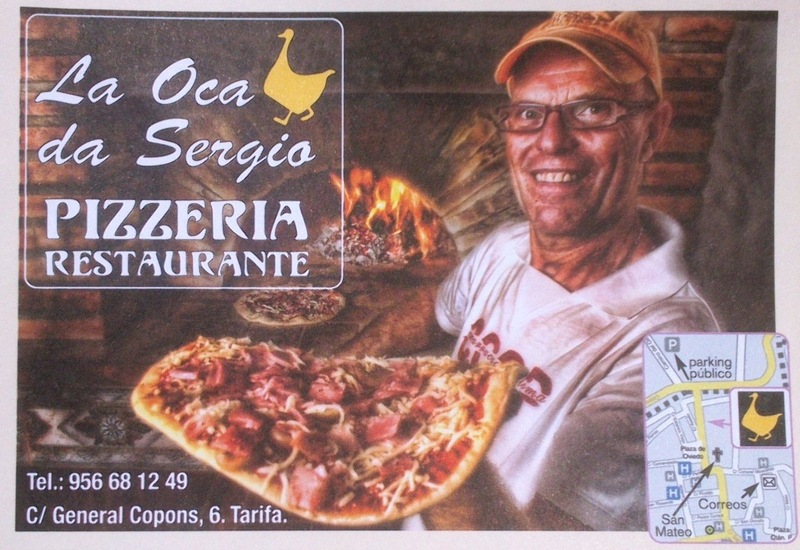 La Oca Da Sergio es un acogedor restaurante italiano detrás de la Iglesia de San Mateo y ofrece los más deliciosos platos italianos como pizzas, pastas y otros en un ambiente agradable y amable. Sergio no sólo es el propietario simpático del restaurante y mountain biker, es probable que tenga en su poder las piernas más fuertes de Tarifa y si usted quiere conseguir algunos consejos sobre dónde ir en bicicleta, Sergio estaría encantado de responder a sus preguntas. La Oca Da Sergio is a cosy italian restaurant behind the San Mateo Church and offers the most delicious Italian dishes like pizza´s, pastas and others in a nice and friendly ambience. Sergio is not only the sympathetic owner of the restaurant and mountainbiker, he probably has in possession the strongest legs of Tarifa and if you want to get some TIP´s about where to go biking, Sergio would be delighted to answer your questions. La Oca Da Sergio is open for lunch and dinner. Not less than 55% of a carbohydrate is required in order to keep the glycogen level in the body. The more glycogen contains the body the longer you can sport.